Yup, I have new textbooks. Seriously, I should stop this bad habit of buying Korean textbooks one after another. After getting the TTMIK book, I promised myself I won’t buy a new textbook and if I want to, I should finish one first before getting a new one. But I broke that promise and decided to get 이화 한국어. 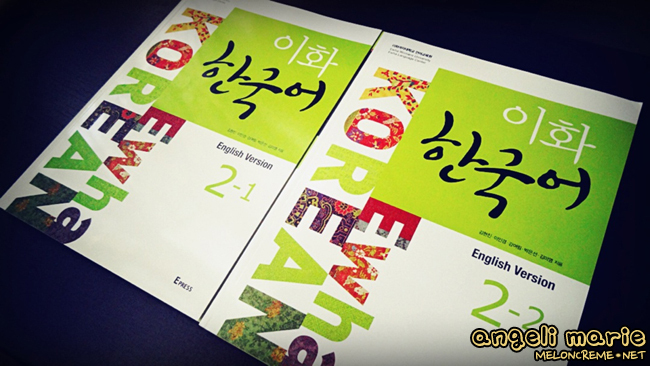 I’ve only finished reading three books: 연세 한국어, Integrated Korean Beginning 1 and Korean Grammar in Use: Beginning. I still have so many books left unread and they’re sitting on my bookshelf, collecting dust. I also have tons of ebooks to read as well. I’m almost done with College Korean and I told myself I must finish it no matter what so I can move on to the next book in the series which is Intermediate College Korean. I’m so excited to read that book. I’ve been spending way too much time reading my 응답하라 1997 novel that I have forgotten about my textbooks. Anyway, I bought this book because Shanna recommended it on her blog. She said it’s even better than 연세 한국어. So I decided to get a copy. I decided to get the level 2 books. I wanted the level 3 books but they don’t have English translation and the entire book is in Korean. I was worried that it might be too advanced for my level so yeah, I settled for level 2. Is it better than 연세 한국어? Yeah. For me, it absolutely is. 연세 한국어보다 이화 한국어는 제 생각에 훨씬 더 좋은 것 같아요. I was disappointed with 연세 한국어 1. I think I expected too much from it. I didn’t learn much from it to be quite honest. The book discussed only a few grammar structures and they were the ones that I have already learned from the internet. And to think I paid P2,000+ for it. Crap. What I love about 이화 한국어 is that you’ll learn tons of new words from reading one chapter. You won’t just see the usual 가다, 먹다, 살다 and other words that you normally see in other textbooks. There are other words such as 부채춤, 탈춤, 독감, 소독약 just to name a few. The words introduced in the book are really diverse. I usually skip exercises since I think they’re just too boring but 이화 한국어 is an exception. I find myself having fun answering the exercises because it way more interesting than the exercises I’ve seen on other books. Fill in the blanks? Multiple choice? Come on, that’s boring and I find it useless to be quite honest. The exercises on 이화 한국어 are far better. They provide the keywords that you need then you create a sentence using those keywords. For example, in the section where it talked about (으)ㄴ 지, the subject, the verb and the period of time has been provided and all you have to do is make a sentence with the (으)ㄴ 지 structure using the keywords provided. Sentence: 나타샤씨는 결혼한 지 5년이 돼었어요. Although the grammar explanations are really short, going through the exercises helps me understand the grammar structure even more and shows me how the grammar structure is supposed to be used. Another thing that I love about these books is that it’s smaller and less bulky compared to 연세 한국어, Integrated Korean and Korean Grammar in Use. It’s compact and very light. The dimensions of the book is 11 inches x 7.5 inches x 0.4 inch. The colors used are easy on the eyes which is a good thing for me because colors can serve as a distraction for me sometimes. There are 7 units on 이화 한국어 2-1 and 8 units on 이화 한국어 2-2. Each unit, you will learn about 4-5 new grammar structures. I have included the list of grammar structures below so check it out to see if Level 2 is the right one for you. There are interesting articles written in Korean per unit and they are lengthy compared to the articles I’ve read on Integrated Korean. Let’s talk about the downsides of this book. I’ve mentioned earlier that the grammar explanations are too short and sometimes I feel like some explanations are a little bit too vague. You may still need to check other textbooks for further explanations and restrictions that 이화 한국어 failed to mention. This is one of the reason why I don’t just stick to one textbook. Another thing that some people might dislike is that the grammar explanations and the English translation of the passages are the only English texts you’ll see in the book. The rest is written in Korean. Yes, even the instructions. Not all exercises have answer key too. I think 이화 한국어 is really good. I’m planning to get the Level 3 books next time. Here is the list of grammar structures that you will learn from the level 2 books. This entry was posted in Learning Korean, Textbook Reviews and tagged ewha korean, ewha textbook, 한국말, 한국어, 한국어 배우기, 이화, 이화 한국어, 이화한국어, korean, korean language, korean studies, learning korean, meloncreme, self study korean, studying korean, textbook review. Bookmark the permalink. Hi, may i know where you bought the book from and how much was it? Sorry to really disturb you again …. Last question. Sorry i’m a noob. So the link can deliver to overseas? Because most of them says that you need ‘worldwide shipping’ to buy. So it doesn’t have and i was wondering can? Yup. They ship internationally. Check the product page and if it says “Available” on Worldwide Shipping then you can purchase it. If it says “Unavailable” then you can’t purchase it. Just be careful when ordering. Make sure you choose the English version (영어) and not Japanese or Chinese. You can also check out Seoul Selection. But they’re a tad bit expensive and their shipping fee is more expensive too. Hi! I have purchased level two of this series as well and agree with you. The books are a great learning tool in comparison to others. Considering the whole of the series (so level 1-5/6? ), up to what level of the Ewha books would you consider to be beginner, intermediate, and advanced? Sorry for the late reply. I was so busy with work. Hmm. I have only seen books 1-3. Books 1 and books 2 are for beginners but there some grammar points in books 2 which can be considered as intermediate already. 3 and 4 are intermediate and 5 and 6 are advanced. The Adventures of Marianne R.
One Shot. 기회는 한 번뿐이야~! Learning Korean is my passion. You can take the girl out of Manila, but not Manila out of the girl. A nut job's blend of daily caffeine kicks and Hangul fix. A web journal of a tiny girl in Seoul, learning languages as her past time. Follow me on my journey as I learn Korean! Korean Study, TOPIK Preparation, Kdramas, Online Quizzes, Rants, Arts etc. For when the journal does not fit the criteria. There is Life, There is Love, There is Korea. Living a life surrounded by Korean.